It’s always an absolute pleasure to come across a promising new indie horror title, particularly if the process of discovery ends in me cowering under a duvet gibbering like your average Lovecraft protagonist. What you wouldn’t see under all the tears – and the duvet of course – is me grinning with delirious glee usually exhibited only by people that spend a lot of time in padded rooms. The adrenaline rush I get from a good, well-crafted, genuinely scary horror game easily dwarfs whatever anemic buzz I might get from gaming’s all-too-common juvenile power fantasy fare. 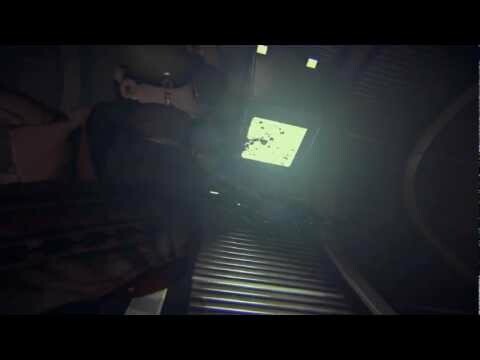 So you bet your arse I was going to bloody well be interested in Routine, a sci-fi themed first-person horror exploration game from UK indie developer Lunar Software. 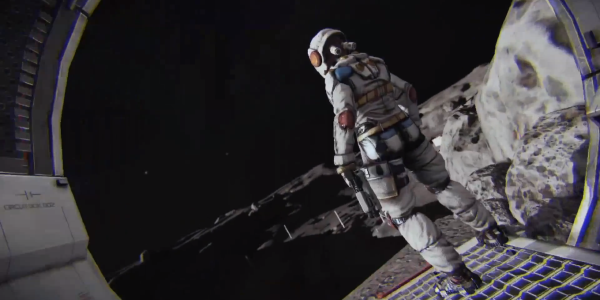 More specifically a sci-fi themed first-person horror exploration game set on the Moon, with you tasked as the poor sod sent out to discover why everyone at a Lunar research base has suddenly vanished without a trace. Lunar Software released a teaser trailer for it today, and to a complete lack of surprise from any of my regular readers I very much liked what I saw. Part of that admittedly came from the opening splash of Lunar Software’s logo, presented like the start of a Weyland-Yutani corporate training video . A nod to 70s/80s sci-fi always scores points with me. The teaser proper starts with that classic evocative sci-fi image of a dead spaceman frozen motionless in mid-air, a spray of blood arcing from his back and (curiously) a 3 1/2-inch floppy disk falling from his left hand. Stop sniggering at the back there: in 1969 they sent men to Moon using a computer with only 2k of RAM. A suitably future-looking firearm is clutched in the unfortunate spaceman’s right hand although not a single bullet is fired throughout the entire trailer, which consists mainly of lots of running around dark gloomy space rooms. At one point it seems the gun is actually some sort of future space camcorder but I still couldn’t shake my apprehension. Silent Hill 2 proves you can have guns and still genuinely disturb players but few other so-called horror games can also make that claim. My fears of a guns-akimbo sci-fi action game in horror clothing were further allayed by promises on the game’s official site of deadzone aiming and no HUD whatsoever, and that to survive “you must run, hide and survive the best you can against what lurks in the base.” Further reassurance came from a thread on Reddit, where artist and designer Jemma Hughes (one of Lunar Software’s three-strong development team) confirmed Routine will also have roguelike elements including randomised environmental hazards, pickups and even parts of the base, along with that whole permadeath thing ubiquitous to roguelikes. In short we can safely assume the Moon in Routine will be a rather harsh mistress, so pack a ballgag and prepare an easily memorised safe word like “pilchards” or “oregano”. By this point I usually regale you all with a brief anecdote about how I’ve literally just finished playing it and am typing all this with trembling hands. Unfortunately and to my profound sadness Routine isn’t due out until 2013 so all we can for now do is gaze upon it from afar like the Moon itself. In the meantime it’s fantastic to see someone try and do justice in gaming form to sci-fi horror movies like Alien, Moon and Event Horizon. If Routine can do for science fiction what Amnesia did for gothic Lovecraftian horror then I’ll be a very happy gibbering nervous wreck indeed. Looks interesting! Kind of Doom-Meets-Amnesia-Meets-Alien!